The Almanor Recreation and Park District contacted the Lake Almanor Country Club earlier in the year to ask about the possibility of the club donating one of its used but good condition lawnmowers from its mower inventory to replace the one the district has, which is small, old and in need of extensive repair. The ARPD had heard that LACC donates equipment as part of the club’s community outreach efforts. Because the district is unfunded, many of its operational and program needs come through donations and sponsorships throughout the year. ARPD Board Member Susan Espana wrote a letter on behalf of the district explaining the need for a new lawnmower to maintain the sports fields. She said LACC’s donation of the 59-HP GroundMaster 4000 mower would be a wonderful contribution to local area youth sports programs that use the Truman-Collins Sports Complex, including youth soccer, softball and Little League play. Scott Devereaux, Lake Almanor Country Club general manager, responded that the company was more than happy to donate the used mower, which it had been kept in storage in the club’s maintenance yard during the past winter. 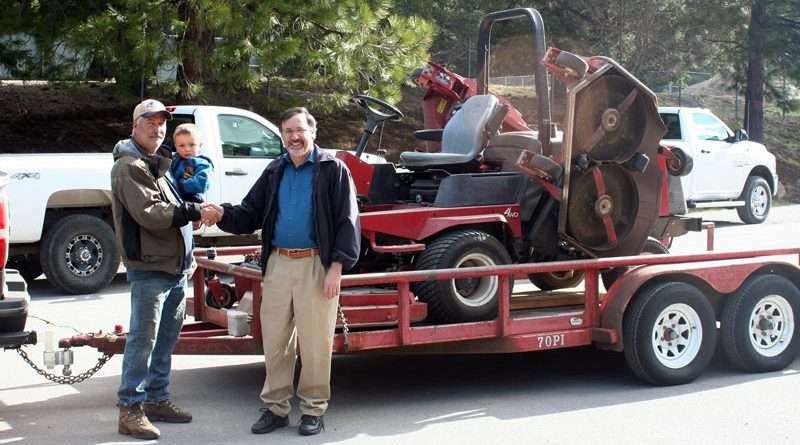 Colleen Garrett, acting ARPD president, wrote to Devereaux that on behalf of the Almanor Recreation and Park District, the board wished to express their sincere gratitude for the replacement mower, which was loaded onto a trailer for delivery April 19.